Honduras is the third poorest country in Latin America and one of the most unequal, with a Gini coefficient of 55, which is high. La Ceiba, on the Atlantic coast of Honduras, is a typical city of the region: American tourism, a local racial mix of mostly Mayans and Africans, big American fruit plantations, and frequent rains. Since 2003, I have been visiting La Ceiba once a year, supporting the creation and development of a rural microfinance institution called Credisol. Over the course of these visits I have been able to observe the increase in drug trafficking activity. 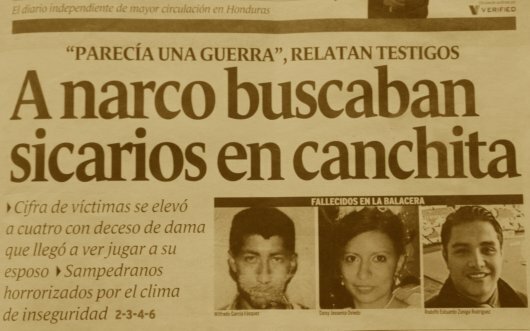 This March 4th, 2011 newspaper clip from La Prensa of San Pedro de Sula, Honduras says, “It was ‘like a war’, say witnesses. Hit men were looking for a drug dealer in the soccer field. The number of victims reached four with the death of the young woman, who came to see her husband playing. 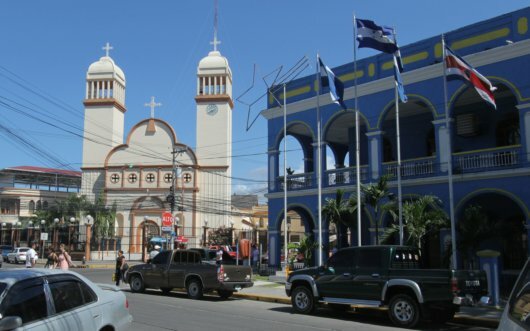 People from San Pedro de Sula are horrified by the climate of insecurity. The core area of drug trafficking is indeed the Department of Colon and the Mosquito Coast area, east of La Ceiba. There, the landing of Colombian avionetas transporting cocaine is common, as are 4X4s and SUVs. It is a strange feeling to witness how the North American and European demand for narcotics drives drug trafficking and violence in Latin America, where I am from. Photo and post by Sebastiao Ferreira. This post is number 9 of 52 in Sebastiao’s 52-week photo journal.